A belated thank you to the staff at Milltown Community Center and most especially Fran and Tony Murphy who truly helped me discover my Irish roots. In planning our trip to Ireland to celebrate our grandniece Hannah’s graduation from nursing school, I started researching my fathers family on Ancestry. My father died when I was only 6 and my mother relocated my sister, who was 16 at the time, and I to Florida two years later. We subsequently lost contact with all the Nolan relatives in Pittsburgh, Pennsylvania. Remember, this was long before Facebook. When my nephew’s wife was pregnant with Hannah she started asking me questions about my side of the family. My sister had died by then and I found myself the official keeper of the family tree. I was appalled by my lack of knowledge. I made several attempts on Ancestry but never got beyond the free trial phase until Hannah expressed an interest in visiting Ireland for her graduation trip. That got me motivated. I was successful in tracking down my great grandfather Michael Nolan and learned from the census records that he had been born in 1833 and immigrated in 1860 accompanied by his wife Mary and their infant daughter also Mary. I was having difficulty finding out any more about the family’s history in Ireland. Through the Mormon family history center in Tucson Arizona I made contact with a professional genealogist and hired her to do some research for me since the date of our trip was fast approaching. She found that the family was from Tuam and that the daughter was baptized in Milltown Parish. I sent a email off to Milltown’s heritage association and quickly heard back from Pauline. She forwarded my email to Tony and Fran Murphy. Imagine my surprise when I heard back from Tony that Fran had gone to Dublin to do some research. We arranged to meet when we were staying in Galway. By the time we arrived, Fran had tracked down the actual farm where Michael Nolan lived. What a thrill to go there and to share that experience with Hannah who up until this point really had no knowledge of her Irish heritage. In the words of an American television commercial: the whole experience was priceless! Those of you who live in Ireland surrounded by your family history have no idea what it is like to discover these family ties and history. I actually pursued this research as a gift to Hannah and her younger sister Julia so they can pass this family knowledge onto their future children. My husband Stan and I are extremely grateful to Tony and Fran for helping us in this quest. What lovely people and so generous with their time and knowledge. 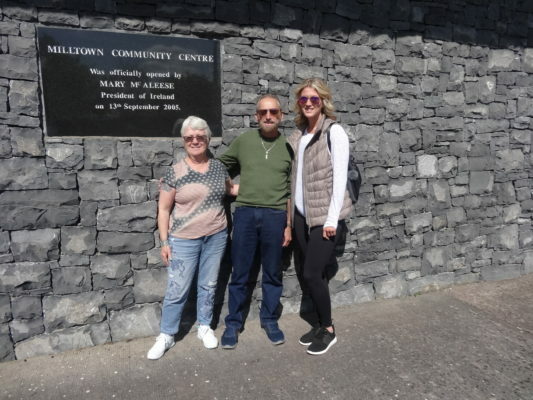 Our thanks to the staff at Milltown’s community center for all their help. Michael’s wife Mary Feerick/feerish remains a bit of a mystery so if any one reading this knows anything about her please feel free to contact me. My search goes on! I still have a few leaves to fill. This page was added on 13/07/2018.